A Jeep loaded with pilots of the 307th Fighter Squadron USAF pulls up alongside one the unit’s Spitfires Mk. VIII at an airfield in Nettuno, Italy, 2 February 1944. Interestingly, among the men posing for the photographs is a Black fighter pilot, probably a member of the 99th Fighter Squadron making a guest appearance. 307th moved to Nettuno only a day before the photo was taken, on 1 February, in support of the Allied landings at Anzio. The dirt airstrip ran along the coast within the newly established beachhead. During the following days the unit was engaged in some heavy fighting with German Focke-Wulfs Fw 190. As the Anzio beachhead failed to expand according to the original plan, the German army pulled forward large amounts of heavy artillery and Nettuno had been repeatedly shelled. 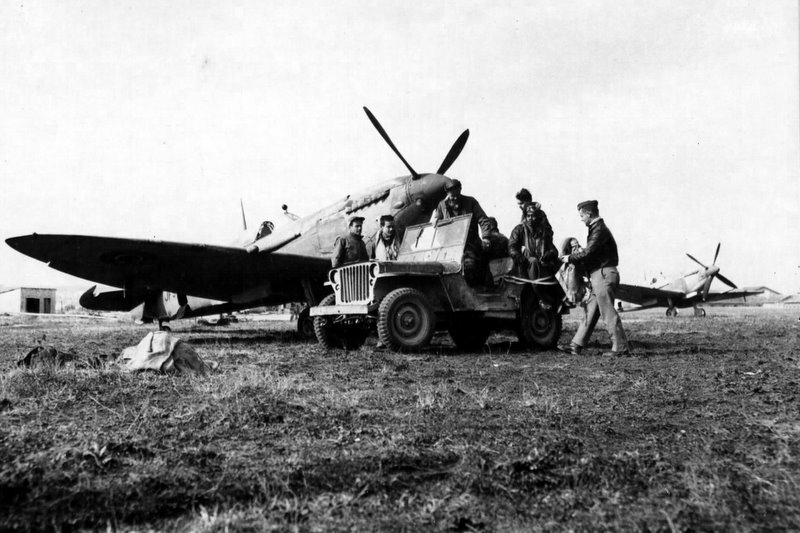 On February 16 it was decided that the airfield was no longer usable for Spitfire operations so the pilots flew their aircraft back to Castel Volturno. In the meantime, the ground echelon remained stuck at Nettuno and spent a rather miserable couple of weeks before they could all be evacuated.